As you can read on the title, there is something new that I want to share. Must be sincere, this is going to be a small trip from past. 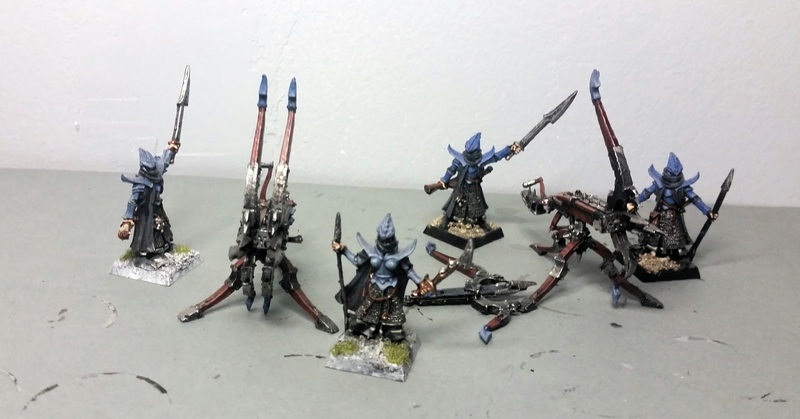 As you know, I am working on a small WH40K Dark Eldar warband, a small group of mercenary that simply reject to live in Commoragh and decided to live away in The Webay. The project is very nice to do, but sometimes you need to return back to your roots, and often there is something that make you have an epiphany. A new plausible future project involves dark elves, so I felt nice to show from where I am starting. 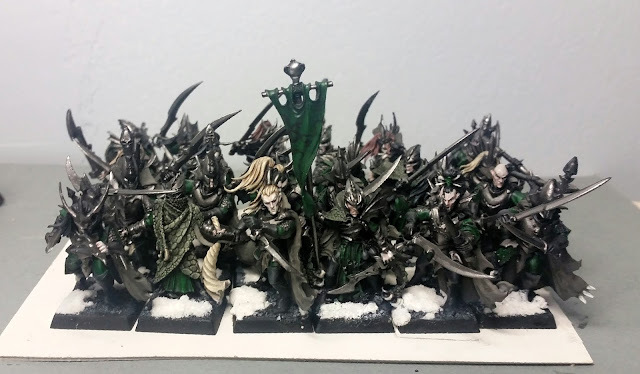 What I have seen of it, is that most of the work are based on chaos, stormcasts, humans, beasts and so on but I have seen very few things of Aelves (elves..). 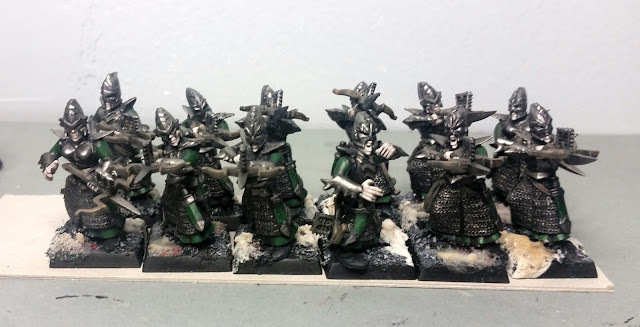 And my first strong love in miniatures was Dark Elves. 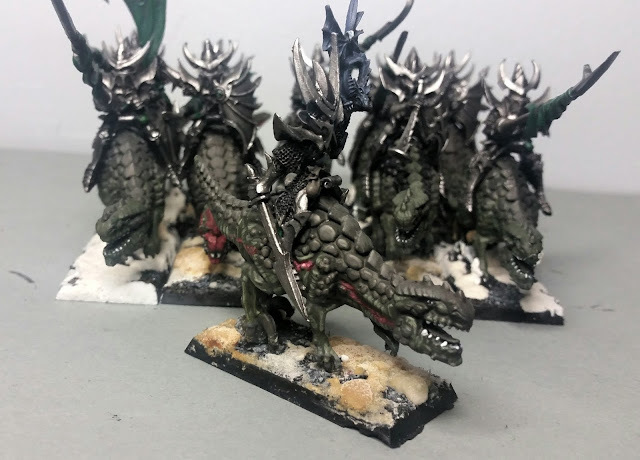 Also, if the Dark Elves are now "good" (ugh) and they are going to be in the way that you can easily in the Silver Tower (double ugh), well sirs, I have to rebel. So welcome to the first post of this new project: from where I am arriving. 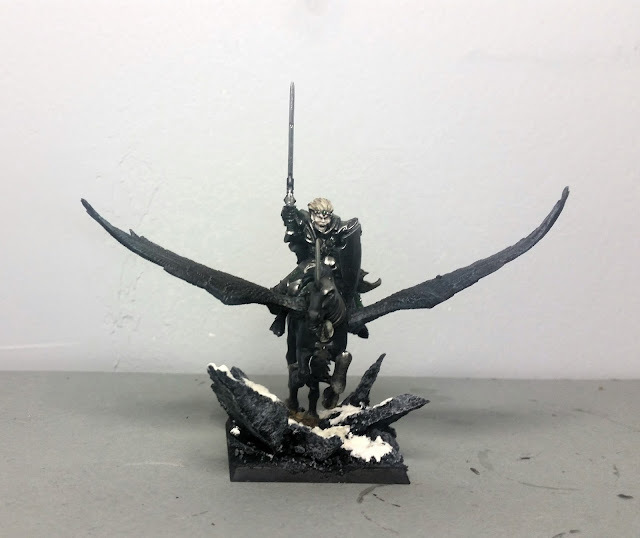 Till I restarted the hobby I have never painted any Dark Elves: so probably, with a great amount of courage, I can show you where I left them. 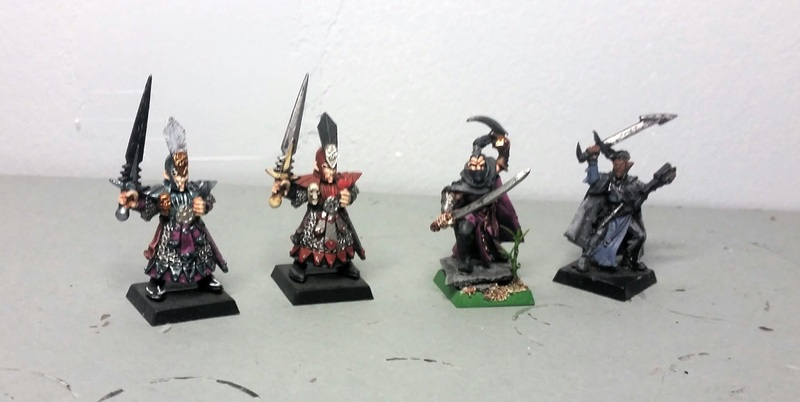 I started to paint miniatures when I was younger, approx 12-13 years old. Here in the newsagents, Citadel started a collection of WHFB and I was totally blown away. I bought then my first kits, a High Elves Dragon Knight and a then if I remember well a box of Lizardmen skinks. And then I discovered Dark Elves. They where brand new, with those sharpened shapes, and I created my army. Some year after I left the hobby and all my Dark Elves lied down half painted. Time passed, and some years ago, approx 3, I was looking my old miniatures, and I've thought "well they cost a lot, I cannot waste them!". 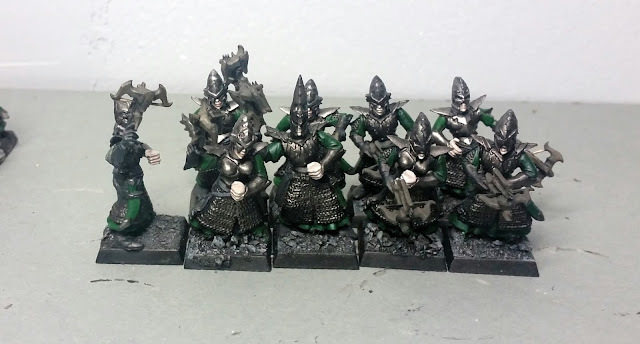 And I restarted paint them, and Dark Elves are the starting of what I am doing right now. So this post is about the recent past, my Dark Elves Army (plus some ooooold painting, about 2000-2003). 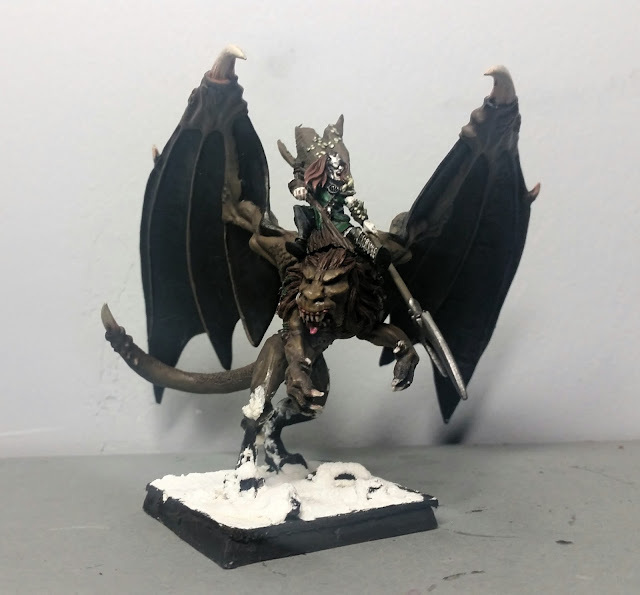 Please be gentle, it was my first project after years of not painting! The general on the black pegasus were one of the miniature I was most proud of. I really love the head, and I would like to have another one to use. The painting scheme is black and green, and you can easily see the colour choice, dark and cold, could be one of my latest: on the other hand the minis are really clean. 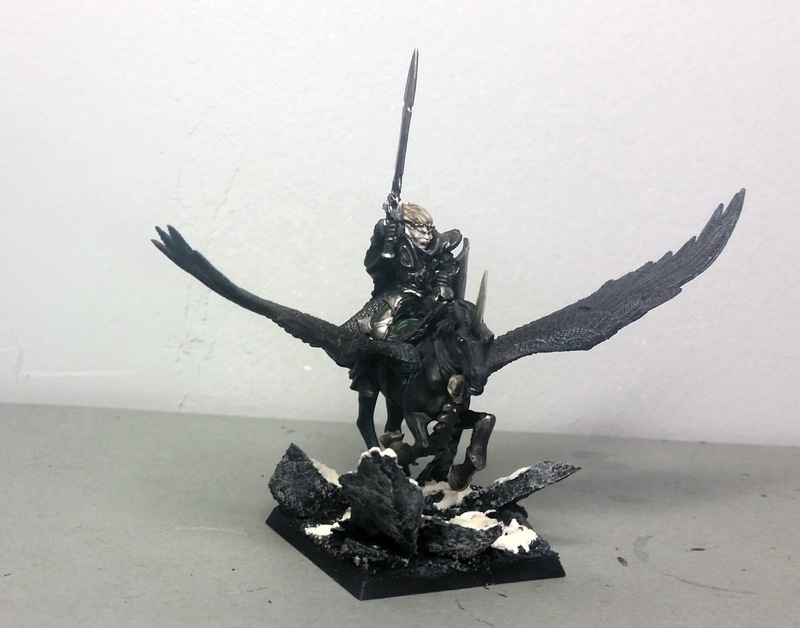 The next miniature was the original one of the general head: I added a corsair head. This mini was a gift of my warhammer old friends. I loved shadows but they were too much similar so I did some very small conversion. I used a mix of baking soda abd white to do the snow, but when I used a bad proportion of them in the mix, the snow could become yellow. Assassins were my favourite ones. 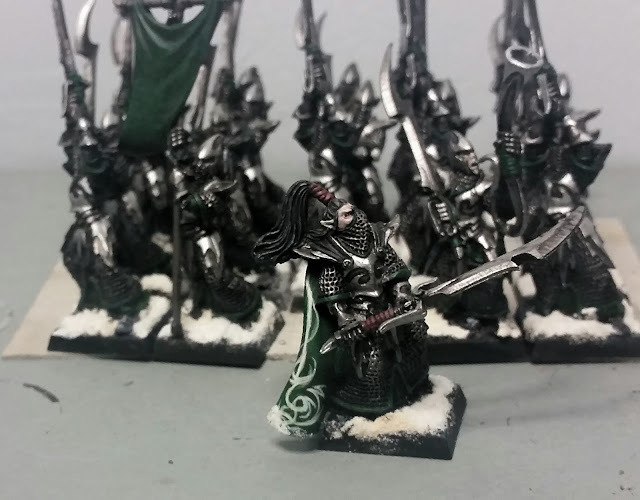 They were what dark elves should be, not clumsy dwarves, nor bright high elves, neither noisy chaos human, but silent, clean and cruel knives in the dark. 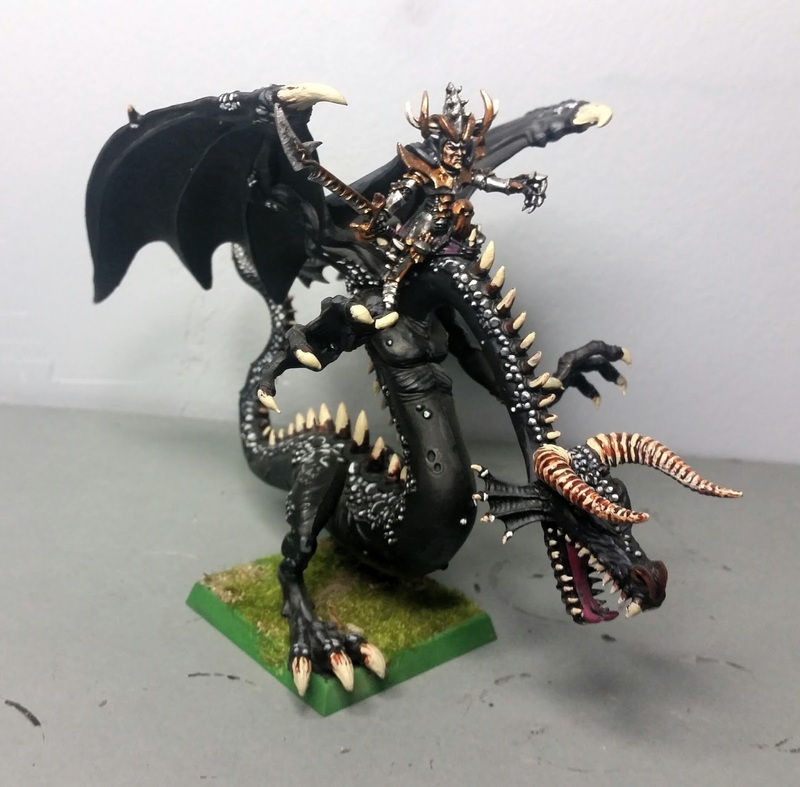 Also, the Central one was my favourite miniature ever. 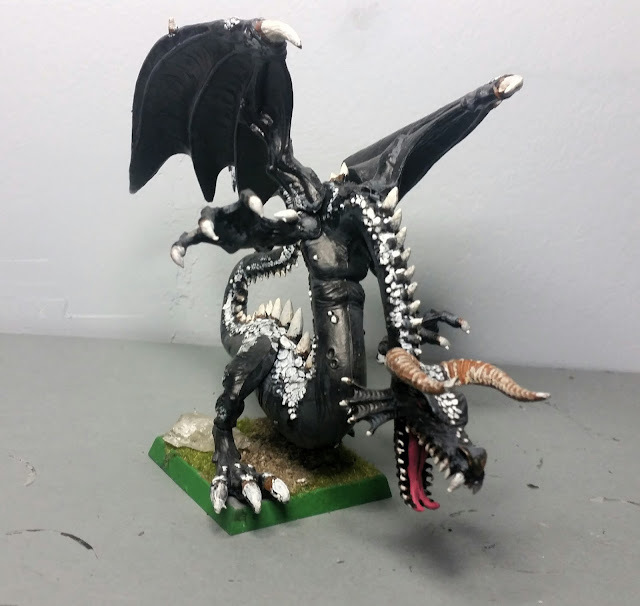 He has also a freehand, probably the best one I have ever made. Three years ago. After something like 10 years of not painting. Lol now I think I could not do something similar after 3 years of exercise, and that was not so much amazing! Dark riders: I did not have my favourite one. With metal minis in blister you had not all the possibility in the blister, so you should be lucky to have in the shop the blister with the minis you wanted. Also, Internet was not so used -by me- and I was young, too much to find other store in good time, and if you add my impatience to have, here we go. Cold Ones Knights. 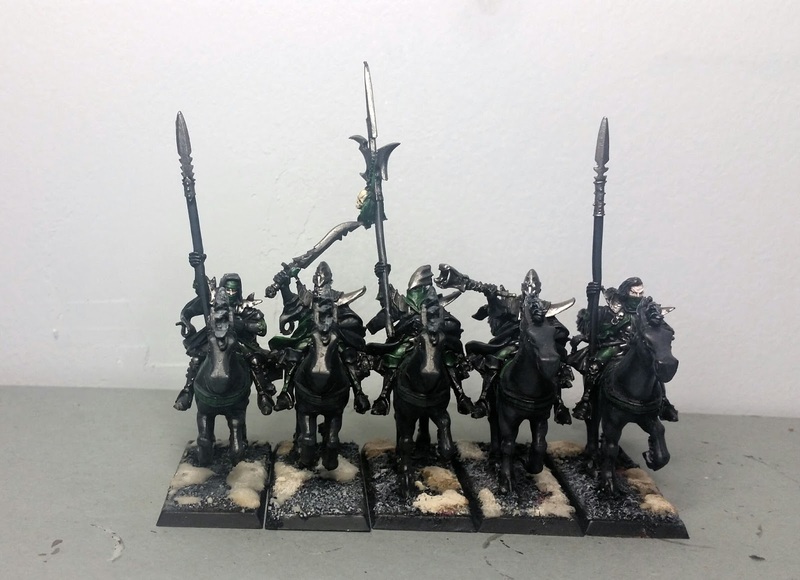 GW did some magnificent futuristic knights, probably the fit better in Aos than in old WHFB. I loved also them, but some shields is not present. I have read that someone here called this version of the Cold Ones something like Cow Ones because in his opinion they resemble cows. Maybe they are not cows, but their face says their rule, stupididy. Ah Malus Darkblade, my favourite character. And now he is dead. No words. This two fellows were the nightmare of the table. And of the wallet, if I remember well, 40€ each one! And I got four of them. Arpies, never loved too much them. They are in metal, so adding a cork base were not a great idea. 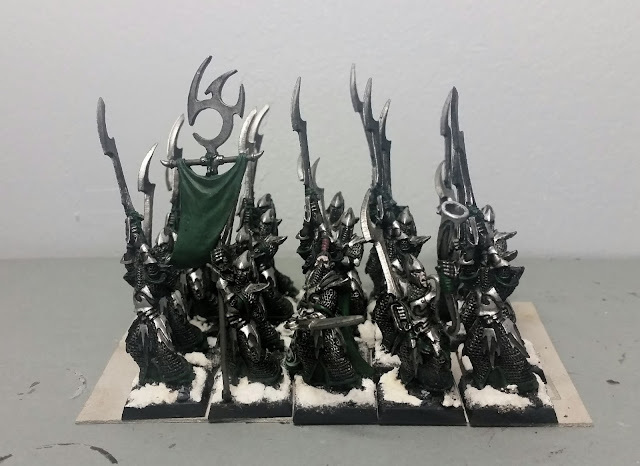 My loved executioners! 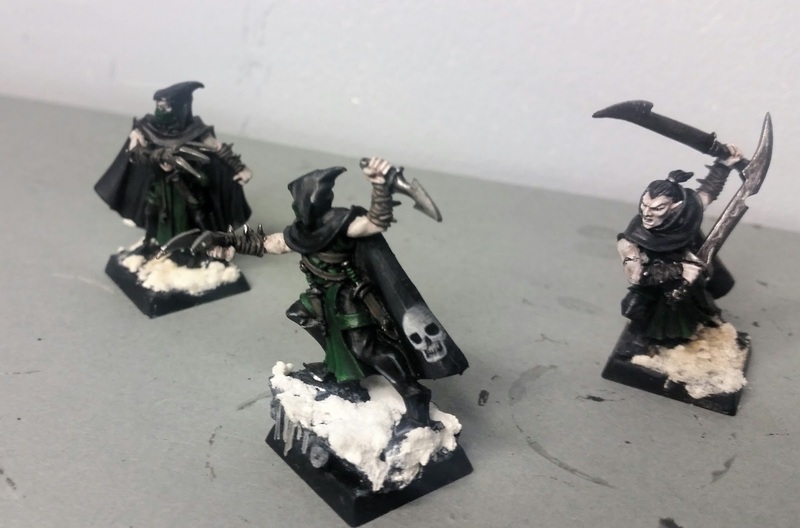 The champion was on the top 3 of my favourite miniatures. What a classy freehand lol! These guys are few because I converted most of them in crossbow men. 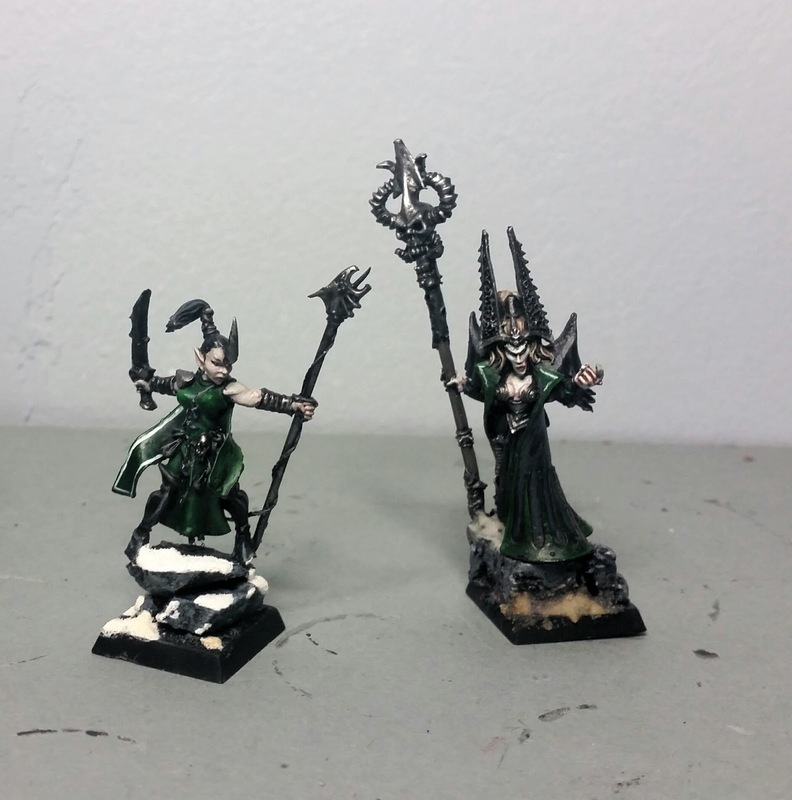 Two sorceress! The left one is converted, the right one were a weird mini, because in all the metal mini there were a small plate between feets to put in the slotted bases, with date -like sprues more or less - and the name of the mini and this one was "morathi", but morathi had another model. Weird mystery. Corsairs! A mix of old and new. The old chief was a failed ooold experiment of conversion so it is disappeared. It was in three version and the blister issue makes my favourite quite rare. Well now I got it but this is another story! Crossbow men. I liked the captain without crossbow that yells to his mates. 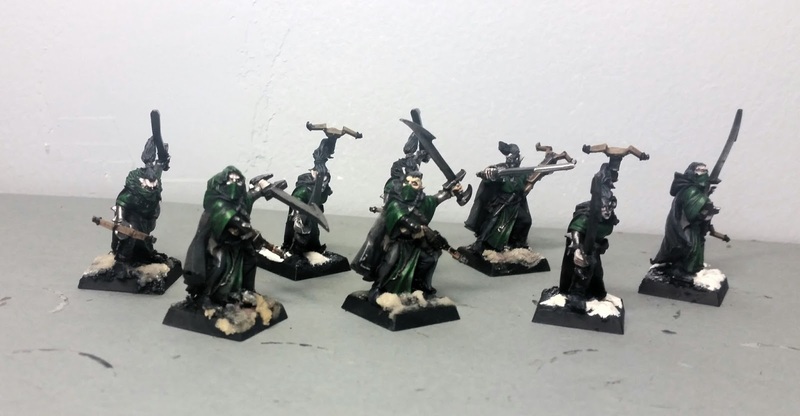 Not finished crossbowmen. I used the corsair crossbows because the original where too much ruined. They must be finished. And now 2000-2003 miniatures with dated painting! No words, they are very ancient! I loved Dragon so I got a pair of them. This is my attempt to paint it. 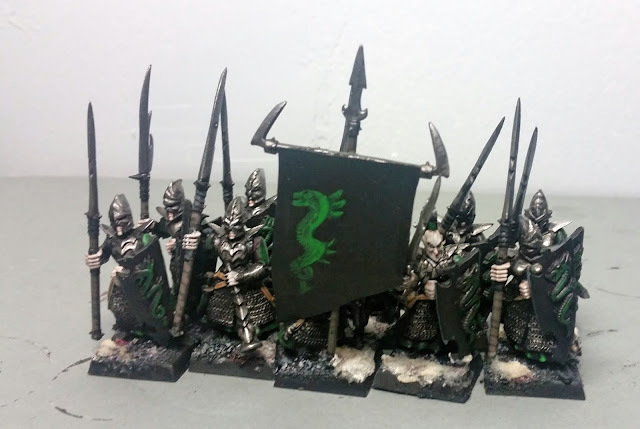 My thought was: it is impossible that 'eavy metal paints a each scale alone, they surely use drybrush. Ehm..
Second dragon! Ah the Witch King. How many dwarves, orcs and chaos scum have you killed? Noticed the green trim of the base, a must. I had a serious problem in thinning paint, but I was very young! My last experiment of painting scheme. The original one was the official GW one, I had a serious issue to go out of it! Now I paint almost nothing with the official colours, however the continue change of a painting scheme is also in the present. Here some last guys. The one in the right middle was painted with the teaching of a painting teacher but I got/get more satisfaction in painting worst but alone. 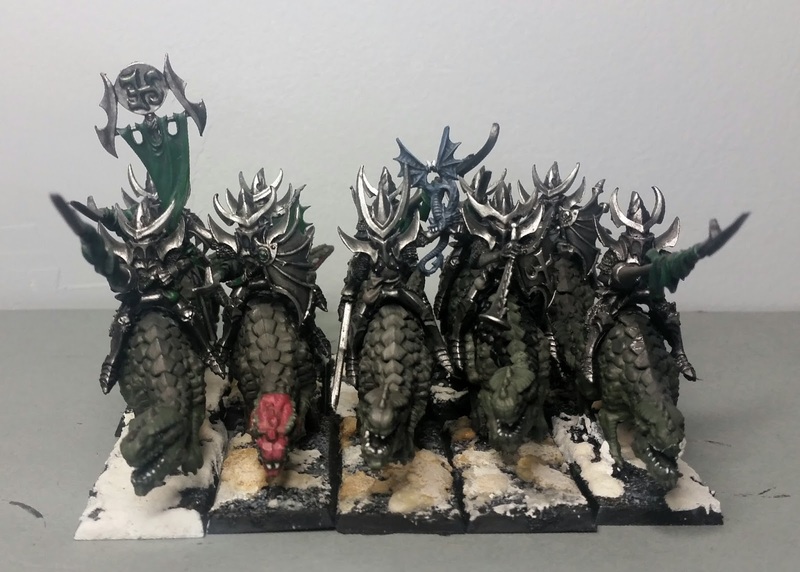 There are also some shields, some metal witches and maybe a pair of cold ones knights to paint but it should be everything. 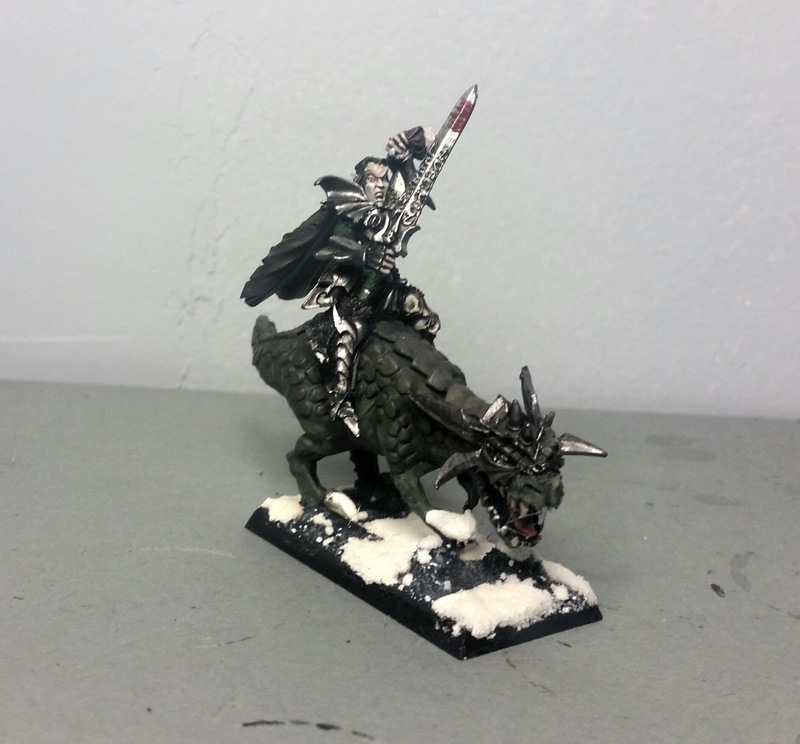 Now you know where I left the Dark Elves but: where I am going? In next posts the next steps of this new project!